Speed is a 1994 American action thriller film directed by Jan de Bont in his feature film directorial debut. The film stars Keanu Reeves, Dennis Hopper, Sandra Bullock, Joe Morton, Alan Ruck, and Jeff Daniels. The film tells the story of an LAPD cop who tries to rescue civilians on a city bus rigged with a bomb programmed to explode if the bus slows down below 50 mph. It became a sleeper hit, critically and commercially successful, grossing $350.4 million on a $30 million budget and winning two Academy Awards, for Best Sound Editing and Best Sound Mixing, at the 67th Academy Awards in 1995. A critically panned sequel, Speed 2: Cruise Control, was released on June 13, 1997. Los Angeles Police Department (LAPD) SWAT officers Jack Traven and Harry Temple thwart an attempt to hold an elevator full of people for a $3 million ransom by a bomber, who is later revealed to be named Howard Payne. As they corner Payne, he grabs Harry. Jack shoots Harry in the leg, forcing the bomber to release Harry. Payne turns away, appearing to die in the explosion of his own device. Jack and Harry are praised by Lieutenant "Mac" McMahon and awarded medals for bravery. Some time later, Jack witnesses a city bus explode. Payne, still alive, contacts Jack on a payphone, explaining that a similar bomb is rigged on another bus. The bomb will arm once the bus reaches 50 miles per hour (80 km/h) and detonate when it drops below 50. The bomber demands a larger ransom of $3.7 million and threatens to detonate the bus if passengers are offloaded. Jack races through freeway traffic and boards the moving bus, which is already over 50 mph. He explains the situation to the driver Sam, but a small-time criminal, fearing Jack is about to arrest him, fires his gun, accidentally wounding Sam. Another passenger, Annie Porter, takes the wheel. Jack examines the bomb under the bus and phones Harry, who uses clues to identify the bomber. The police clear a route for the bus to the unopened 105 freeway. Mac demands they offload the passengers onto a pacing flatbed truck, but Jack warns about Payne's instructions. Payne allows the officers to offload the injured Sam for medical attention, but then detonates a smaller bomb which kills another passenger who attempts to escape. When Jack learns that part of the elevated freeway ahead is incomplete, he persuades Annie to accelerate the bus and jump the gap. He directs her to the nearby Los Angeles International Airport to drive on the unobstructed runways. Meanwhile, Harry identifies Payne's name, his former role as a retired Atlanta bomb squad officer, and his local Los Angeles address. Harry leads a SWAT team to Payne's home, but the house is rigged with explosives which go off, killing Harry and most of his team in the process. Jack rides under the bus on a towed sledge, but he cannot defuse the bomb, and accidentally punctures the fuel tanks when the sledge breaks from its tow line. Once pulled back aboard by the passengers, Jack learns that Harry has died and that Payne has been watching the passengers on the bus with a hidden video camera. Mac has a local news crew record the transmission and rebroadcast it in a loop to fool Payne, while the passengers are offloaded onto an airport bus. The bus suffers a flat tire, forcing Jack and Annie to escape via a floor access panel. Out of fuel, the bus slows to 50 mph and explodes as it collides with an empty Boeing 707 cargo plane. Jack and Mac head to Pershing Square to drop the ransom into a waste can. Realizing he has been fooled, Payne poses as a police officer and seizes Annie and the money. Jack follows them into the Metro Red Line subway, where Annie is wearing a vest covered with explosives rigged to a pressure-release detonator. Payne hijacks a subway train, handcuffs Annie to a pole, and sets the train in motion while Jack pursues them. After killing the train driver, Payne attempts a bribe with the ransom money but is enraged when a dye pack in the money bag goes off. He and Jack fight on the roof of the train, until Payne is decapitated by an overhead light signal. Jack removes the vest from Annie, but she is still handcuffed. Realizing Payne killed the driver and shot the control panel at the same time, rendering the controls unusable, Jack accelerates the train, causing it to smash through an end-of-track construction site and burst onto Hollywood Boulevard before coming to a stop. Finally finished with the adventure, Jack and Annie share a kiss. Part of the film featured the bus making its way onto Interstate 110 through the traffic. Screenwriter Graham Yost was told by his father, Canadian television host Elwy Yost, about a film called Runaway Train starring Jon Voight, about a train that speeds out of control. The film was based on an idea by Akira Kurosawa. Elwy mistakenly believed that the train's situation was due to a bomb on board. Such a theme had in fact been used in the 1975 Japanese film The Bullet Train. After seeing the Voight film, Graham decided that it would have been better if there had been a bomb on board a bus with the bus being forced to travel at 20 mph to prevent an actual explosion. A friend suggested that this be increased to 50 mph. The film's end was inspired by the end of the 1976 film Silver Streak. 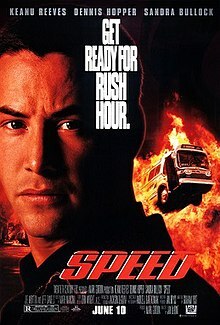 Yost had initially named the film Minimum Speed reflecting on the plot element of the bus unable to drop below a speed. He realized that using "minimum" would immediately apply a negative connotation to the title, and simply renamed it to Speed. 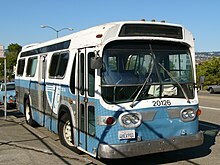 Yost's initial script would have the film completely occur with the bus; there was no initial elevator scene, the bus would have driven around Dodgers Stadium due to the ability to drive around in circles, and would have culminated with the bus running into the Hollywood Sign and destroying it. Upon finishing the script, Yost took his idea to Paramount Pictures, which expressed interest in green-lighting the film and chose John McTiernan due to his blockbuster films Predator, Die Hard, and The Hunt for Red October. However, McTiernan eventually declined to do so, feeling the script was too much of a Die Hard retread, and suggested Jan De Bont, who agreed to direct because he had the experience of being the photography director for action movies, including McTiernan's Die Hard and The Hunt for Red October. Despite a promising script, Paramount passed on the project, feeling audiences would not want to see a movie which takes place for two hours on a bus, so De Bont and Yost then took the project to 20th Century Fox which also distributed Die Hard. Fox agreed to green-light the project on the condition there were action sequences in the film other than the bus. De Bont then suggested starting the film off with the bomb on an elevator in an office building, as he had an experience of being trapped in an elevator while working on Die Hard. Yost used the opening elevator scene to establish Traven as being clever enough to overcome the villain, comparable to Perseus tricking Medusa into looking at her own reflection. Yost then decided to conclude the film on a subway train to have a final plot twist not involving the action on the bus. Fox then immediately approved the project. In preparing the shooting script, one unnamed author had revised Yost's script in a manner that Yost had called "terrible". Yost spent three days "reconfiguring" this draft. Jan de Bont brought in Joss Whedon a week before principal photography started to work on the script. According to Yost: "Joss Whedon wrote 98.9 percent of the dialogue. We were very much in sync, it's just that I didn't write the dialogue as well as he did." One of Whedon's contributions was reworking Traven's character once Keanu Reeves was cast. Reeves did not like how the Jack Traven character came across in Yost's original screenplay. He felt that there were "situations set up for one-liners and I felt it was forced—Die Hard mixed with some kind of screwball comedy." With Reeves' input, Whedon changed Traven from being "a maverick hotshot" to "the polite guy trying not to get anybody killed," and removed the character's glib dialogue and made him more earnest. Yost also gave Whedon credit for the "Pop quiz, hotshot" line. Another of Whedon's contributions was changing the character of Doug Stephens (Alan Ruck) from a lawyer ("a bad guy and he died", according to the writer) to a tourist, "just a nice, totally out-of-his-depth guy". Whedon worked predominantly on the dialogue, but also created a few significant plot points, like the killing of Harry Temple. Yost had originally planned for Temple to be the villain of the story, as he felt that having an off-screen antagonist would not be interesting. However, Yost recognized that there was a lot of work in the script to establish Temple as this villain. When Dennis Hopper was cast as Howard Payne, Yost recognized that Hopper's Payne readily worked as a villain, allowing them to rewrite Temple to be non-complicit in the bomb situation. Stephen Baldwin, the first choice for the role of Jack Traven, declined the offer because he felt the character (as written in the earlier version of the script) was too much like the John McClane character from Die Hard. According to Yost, they had also considered Tom Cruise, Tom Hanks, Wesley Snipes and Woody Harrelson. Director Jan de Bont ultimately cast Keanu Reeves as Jack Traven after seeing him in Point Break. He felt that the actor was "vulnerable on the screen. He's not threatening to men because he's not that bulky, and he looks great to women". Reeves had dealt with the Los Angeles Police Department (LAPD) before on Point Break, and learned about their concern for human life, which he incorporated into Traven. The director did not want Traven to have long hair and wanted the character "to look strong and in control of himself". To that end, Reeves shaved his head almost completely. The director remembers, "everyone at the studio was scared shitless when they first saw it. There was only like a millimeter. What you see in the movie is actually grown in". Reeves also spent two months at Gold's Gym in Los Angeles to get in shape for the role. For the character of Annie, Yost said that they initially wrote the character as African American and as a paramedic as to justify how she would be able to handle driving a speeding bus through traffic. The role was offered to Halle Berry but she declined the part. Later, the character had then been changed to a driver's education teacher, and made the character more of a comic-relief sidekick to Jack, with Ellen DeGeneres in mind for the part. Instead, Annie became both Jack's sidekick and later love interest, leading to the casting of Sandra Bullock. Sandra Bullock came to read for Speed with Reeves to make sure there was the right chemistry between the two actors. She recalls that they had to do "all these really physical scenes together, rolling around on the floor and stuff." Principal photography began on September 7, 1993, and completed on December 23, 1993, in Los Angeles. De Bont used an 80-foot model of a 50-story elevator shaft for the opening sequence. While Speed was in production, actor and Reeves's close friend River Phoenix died. Immediately after Phoenix died, de Bont changed the shooting schedule to work around Reeves and give him scenes that were easier to do. "It got to him emotionally. He became very quiet, and it took him quite a while to work it out by himself and calm down. It scared the hell out of him", de Bont recalls. Initially, Reeves was nervous about the film's many action sequences but as the shooting progressed he became more involved. He wanted to do the stunt in which Traven jumps from a Jaguar onto the bus himself, and rehearsed it in secret after de Bont disapproved. On the day of the sequence, Reeves did the stunt himself, terrifying de Bont in the process. Eleven GM New Look buses and three Grumman 870 buses were used in the film's production. Two of them were blown up, one was used for the high-speed scenes, one had the front cut off for inside shots, and one was used solely for the "under bus" shots. Another bus was used for the bus jump scene, which was done in one take. Eleven GM New Look buses were used to represent the bus in the film. 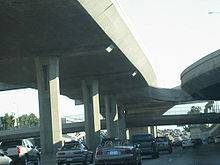 Many of the film's freeway scenes were filmed on California's Interstate 105 and Interstate 110 at the stack interchange known today as the Judge Harry Pregerson Interchange, which was not officially open at the time of filming. While scouting this location, De Bont noticed big sections of road missing and told screenwriter Graham Yost to add the bus jump over the unfinished freeway to the script. In the scene in which the bus must jump across a gap in an uncompleted elevated freeway-to-freeway ramp while still under construction, a ramp was used to give the bus the necessary lift off so that it could jump the full fifty feet. The bus used in the jump was empty except for the driver, who wore a shock-absorbing harness that suspended him mid-air above the seat, so he could handle the jolt on landing, and avoid spinal injury (as was the case for many stuntmen in previous years that were handling similar stunts). The highway section the bus jumped over is the directional ramp from I-105 WB to I-110 NB (not the HOV ramp from I-110 SB to I-105 WB as commonly believed), and as the flyover was already constructed, a gap was added in the editing process using computer-generated imagery. A 2009 episode of Mythbusters attempted to recreate the bus jump as proposed, including the various tricks that they knew were used by the filmmakers such as the ramp, and proved that the jump, as in the film, would never have been possible. On a commentary track on the region 1 DVD, De Bont reports that the bus jump stunt did not go as planned. To do the jump the bus had everything possible removed to make it lighter. On the first try the stunt driver missed the ramp and crashed the bus, making it unusable. This was not reported to the studio at the time. A second bus was prepared and two days later a second attempt was successful. But, again, things did not go as intended. Advised that the bus would only go about 20 feet, the director placed one of his multiple cameras in a position that was supposed to capture the bus landing. However, the bus traveled much farther airborne than anyone had thought possible. It crashed down on top of the camera and destroyed it. Luckily, another camera placed about 90 feet from the jump ramp recorded the event. Filming of the final scenes occurred at Mojave Airport, which doubled for Los Angeles International Airport. The shots of the LACMTA Metro Red Line through the construction zone were shot using an 1/8 scale model of the Metro Red Line, except for the jump when it derailed. Stunt coordinator Tracy Bunting told Interview Magazine that this was "the most challenging" of her career, in particular the iconic "stroller full of cans" scene. The MD520N helicopter used throughout the film, registration N599DB, Serial LN024, was sold to the Calgary Police Service in 1995, where it was in use until 2006; it was then sold to a private owner. Speed was released on June 10, 1994, in 2,138 theaters and debuted at the number one position, grossing $14.5 million on its opening weekend. It went on to gross $121.3 million domestically and $229.2 million internationally for a worldwide total of $350.5 million, well above its $30 million production budget. Speed received critical acclaim and currently has a "certified fresh" score of 93% on Rotten Tomatoes based on 60 reviews with an average rating of 7.9/10. The critical consensus states "A terrific popcorn thriller, Speed is taut, tense, and energetic, with outstanding performances from Keanu Reeves, Dennis Hopper, and Sandra Bullock." The film also has a score of 78 out of 100 on Metacritic based on 17 critics indicating "Generally favorable reviews." Audiences polled by CinemaScore gave the film an average grade of "A" on an A+ to F scale. Film critic Roger Ebert gave the film four out of four stars and wrote, "Films like Speed belong to the genre I call Bruised Forearm Movies, because you're always grabbing the arm of the person sitting next to you. Done wrong, they seem like tired replays of old chase cliches. Done well, they're fun. Done as well as Speed, they generate a kind of manic exhilaration". In his review for Rolling Stone magazine, Peter Travers wrote, "Action flicks are usually written off as a debased genre, unless, of course, they work. And Speed works like a charm. It's a reminder of how much movie escapism can still stir us when it's dished out with this kind of dazzle". In her review for The New York Times, Janet Maslin wrote, "Mr. Hopper finds nice new ways to convey crazy menace with each new role. Certainly he's the most colorful figure in a film that wastes no time on character development or personality". Entertainment Weekly gave the film an "A" rating and Owen Gleiberman wrote, "It's a pleasure to be in the hands of an action filmmaker who respects the audience. De Bont's craftsmanship is so supple that even the triple ending feels justified, like the cataclysmic final stage of a Sega death match". Time magazine's Richard Schickel wrote, "The movie has two virtues essential to good pop thrillers. First, it plugs uncomplicatedly into lurking anxieties—in this case the ones we brush aside when we daily surrender ourselves to mass transit in a world where the loonies are everywhere". Filmmaker Quentin Tarantino (who was also commissioned to direct the film, but declined) named[when?] the film one of the twenty best films he had seen since 1992. Entertainment Weekly magazine's Owen Gleiberman ranked Speed as 1994's eighth best film. The magazine also ranked the film eighth on their "The Best Rock-'em, Sock-'em Movies of the Past 25 Years" list. Speed also ranks 451 on Empire magazine's 2008 list of "The 500 Greatest Movies of All Time". Mark Kermode of the BBC recalled having named Speed his film of the month working at Radio 1 at the time of release, and stated in 2017, having re-watched the film for the first time in many years, that it had stood the test of time and was a masterpiece. On November 8, 1994, Fox Video released Speed on VHS and LaserDisc formats for the very first time. Rental and video sales did very well and helped the film's domestic gross. The original VHS cassette was only available in standard 4/3 TV format at the time and in October 1996, Fox Video re-released a VHS version of the film in widescreen allowing the viewer to see the film in a similar format to its theatrical release. On November 3, 1998, 20th Century Fox Home Entertainment released Speed on DVD for the very first time. The DVD was in a widescreen format but, other than the film's theatrical trailer, the DVD contained no extras aside from the film. In 2002, Fox released a special collector's edition of the film with many extras and a remastered format of the film. Fox re-released this edition several times throughout the years with different covering and finally, in November 2006, Speed was released on a Blu-ray Disc format with over five hours of special features. A soundtrack album featuring "songs from and inspired by" the film was released on 28 June 1994 with the following tracks The soundtrack was commercially successful in Japan, being certified gold by the RIAJ in 2002. In addition to the soundtrack release, a separate album featuring 40 minutes of Mark Mancina's score from the film was released on 30 August 1994. The CD track order does not follow the chronological order of the film's events. La-La Land Records released a limited expanded version of Mark Mancina's score on 28 February 2012. The newly remastered release features 69:25 of music spread over 32 tracks (in chronological order). In addition, it includes the song "Speed" by Billy Idol. In 1997, a sequel, Speed 2: Cruise Control, was released. Sandra Bullock agreed to star again as Annie, for financial backing for another project, but Keanu Reeves declined the offer to return as Jack. As a result, Jason Patric was written into the story as Alex Shaw, Annie's new boyfriend, with her and Jack having broken up due to her worry about Jack's dangerous lifestyle. Willem Dafoe starred as the villain John Geiger, and Glenn Plummer (who played Reeves' carjacking victim) also cameos as the same character, this time driving a boat that Alex takes control of. The film is considered one of the worst sequels of all time, scoring only 3% (based on 64 reviews) on Rotten Tomatoes. The film is parodied in the UK Channel 4 sitcom Father Ted, in the episode "Speed 3", where Father Dougal drives a booby-trapped milk float that will explode if the speed falls below 4 mph. ^ a b "IMDb: Box office/business for 'Speed'". Retrieved 2011-05-08. ^ Leong, Anthony. "Speed Movie Review". Retrieved 2011-05-08. ^ a b c d e f g h i j Bierly, Mandi (June 10, 2014). "'Speed' 20th anniversary: Screenwriter Graham Yost looks back". Entertainment Weekly. Retrieved January 19, 2018. ^ a b c d O'Hare, Kate (June 6, 2003). "The 'Bus Guy' triumphs". The Post-Star. Retrieved November 5, 2013. ^ a b c d Kozak, Jim (August–September 2005). "Serenity Now!". In Focus. Archived from the original on 2011-06-15. Retrieved 2009-04-09. ^ a b c d e f g h i j Gerosa, Melina (1994-06-10). "Speed Racer". Entertainment Weekly. Retrieved 2009-04-09. ^ a b Svetkey, Benjamin (1994-07-22). "Overdrive". Entertainment Weekly. Retrieved 2009-04-09. ^ a b McCabe, Bob (June 1999). "Speed". Empire. p. 121. ^ "1979 Grumman Flxible 870 ADB in "Speed, 1994"". IMCDb.org. Retrieved 2013-04-06. ^ a b c Dennis Hopper (host) (1994). The Making of 'Speed' (Documentary). 20th Century Fox. ^ GJW. "Speed: Filming Locations - part 4". ^ Mackie, Drew (June 13, 2014). "20 Reasons to Love Speed, 20 Years Later". People. Retrieved January 19, 2018. ^ a b "C-FCPS C-GCPS N599DB McDonnell Douglas MD520N C/N LN024". ^ Service, Calgary Police (24 January 2013). "Helicopter Air Watch for Community Safety HAWCS". ^ "Speed". Box Office Mojo. Retrieved 2008-12-03. ^ Ebert, Roger (1994-06-10). "Speed". Chicago Sun-Times. Retrieved 2008-12-03. ^ Travers, Peter (1994-06-30). "Speed". Rolling Stone. Retrieved 2008-12-03. ^ Maslin, Janet (1994-06-10). "An Express Bus in a Very Fast Lane". The New York Times. Retrieved 2008-12-03. ^ Gleiberman, Owen (1994-06-17). "Speed". Entertainment Weekly. Retrieved 2009-04-09. ^ Schickel, Richard (1994-06-13). "Brain Dead but Not Stupid". Time. Retrieved 2009-04-09. ^ Gleiberman, Owen (1994-12-30). "The Best & Worst 1994/Movie". Entertainment Weekly. Retrieved 2009-04-09. ^ "The Action 25: The Best Rock-'em, Sock-'em Movies of the Past 25 Years". Entertainment Weekly. Retrieved 2009-04-09. ^ "The 500 Greatest Movies of All Time". Empire. Retrieved 2009-04-09. ^ "The Need for Speed". 2017-12-08. ^ "AFI's 100 Years...100 Thrills" (PDF). Retrieved 2013-04-06. ^ "Speed: Songs From And Inspired By The Motion Picture (Soundtrack)". Retrieved May 4, 2011. ^ "GOLD ALBUM 他認定作品 2002年2月度" [Gold Albums, and other certified works. February 2002 Edition] (PDF). The Record (Bulletin) (in Japanese). 509: 13. April 10, 2002. Archived from the original (PDF) on January 17, 2014. Retrieved January 22, 2014. ^ "Speed: Original Motion Picture Score (Soundtrack)". Retrieved May 4, 2011. ^ "Speed 2 - Cruise Control". Rotten Tomatoes. Flixster. Retrieved 2013-08-04.